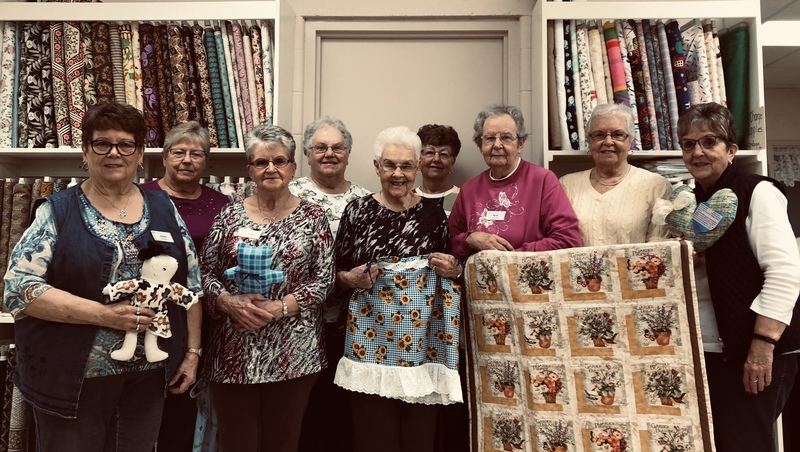 The Sewing Room volunteers at Heritage Pointe of Warren were very busy in 2018. Volunteers gather and enjoy visiting as they sew, quilt, and crochet. In the past year alone, the “sewing ladies” made items to be donated to area hospitals, abuse centers, homeless shelters, hospice patients, the Warren food pantry, and the Heritage Pointe daycare. These donations included an amazing count of 384 dolls, 392 bears, 205 hats for cancer patients, and 305 heart pillows for those having heart surgery. Other donations have very specific uses like the Octopus-shaped snugglers which have been found to help NICU babies thrive by simulating the feel of the umbilical cord in the womb. Additionally, over 600 port pillows were made to provide comfort to those receiving IV treatments. The ladies in the group continue to have a heart for their own community as well. One example of this is volunteer, Ruth Herring, who has personally made over 40 quilts for veterans who have lived at Heritage Pointe of Warren. In the past, volunteers have also made wall hangings, towels for the beauty shop and rice bags for resident pain relief. In order to make all of these donations, volunteers have been blessed with donations from local townspeople, other residents and businesses. Matilda Jane Clothing, of Fort Wayne, has donated their beautiful and unique material toward these projects. Also Smith Brothers of Berne, has donated the stuffing for the pillows and dolls. If the mission projects aren’t enough to keep the volunteers busy, they also sew items to be sold in the Heritage Pointe gift shop, which include neck pillows, pot holders, aprons and baby items. They also continue to mend clothing, hem pants and repair zippers. While most of the sewing volunteers reside somewhere on the Warren campus, some are from the community. If you or someone you know enjoys sewing, please join them on Tuesdays and Fridays at 10am in the Heritage Pointe of Warren sewing room. If you have questions regarding the group, have a need or want to make a donation, call 260-375-2201 ext. 4237.